It likely will not take very much to convince you that Paris is always a good idea! The French Open (major tennis tournament) was just played over the past two weeks in the city of love and so I was inspired to look back on my most recent visit to Paris. Two years ago, my sister-in-law and I had the opportunity to travel to Paris for a weekend. What more could two girls ask for!? 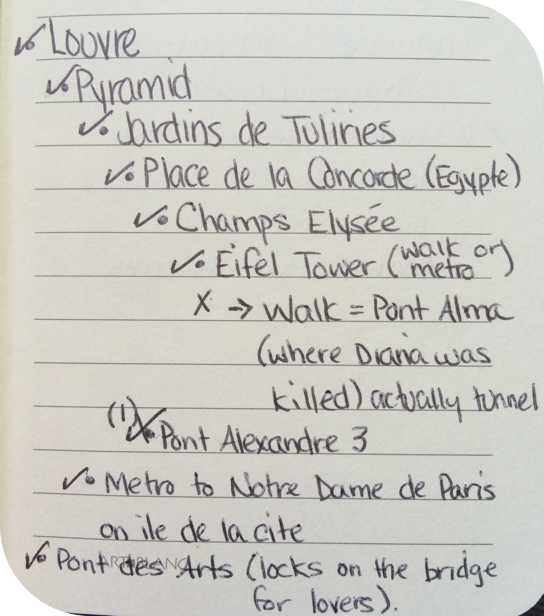 Since we had two days, we made a checklist of all the “must-do” activities and landmarks we “had” to see and set out for 48 hours of fun! There are more than enough landmarks in this city to keep you going for quite a while, but if you are there for 2 days and want to feel like you saw everything… well put on some comfortable flat shoes and hit the cobblestones. Start your day at the Louvre and go from there. 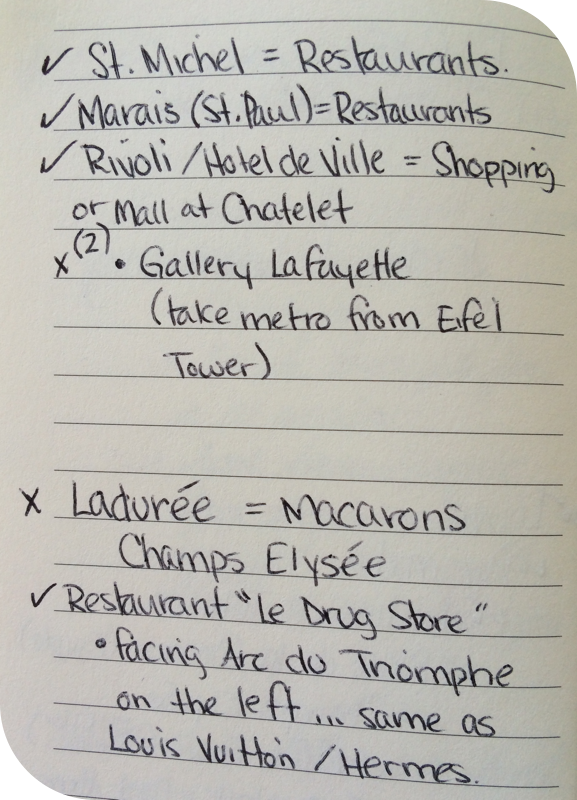 In our case this was about a 1-2 hour stop – we are not art lovers and really just wanted to see the Mona Lisa… Next, follow my notes which will lead you to the Champs Elysees. Side Note: “Pyramid” on my list is the pyramid in the courtyard of the Louvre… I have no idea the actual name but somehow remembered it as a landmark from a previous trip to Paris. Second Side Note: If you understand French listen to this song before your trip. As you walk down Champs Elysees it will surely play in your head and make you want to skip down the street basking in the pure happiness of being in Paris. Third Side Note: I speak French! When your feet get tired, because let’s face it… no matter which shoes you choose, they will – take a bicycle taxi. Completely a touristy thing to do, but honestly, it was super fun! Remember the next time you are in Paris you might have a stroller, baby and family with you… this would be one of those non-stroller friendly things to do. And speaking of shopping… The Christian Louboutin store was at the very top of my list this trip! If you have the chance and extra cash you are willing to invest (yes, invest… think about it… you only get one set of feet for your whole life – it’s your duty to look after them and make them look as fabulous as possible!) go to this store! While you are there – try a few pairs on and enjoy the luxury experience! In my case, this could quite possibly be a once in a life time experience and I am thrilled (and very thankful!) to have shared it with my sister-in-law and have the shoes to remember it by. Last, but certainly not least, and with risk of sounding like one of my favourite country songs, go see the Eiffel Tower at night! I had seen the Eiffel Tower before, but this was the first time I saw it at night… it really makes you feel like you are in Paris seeing it all lit up – don’t miss the opportunity!